As a result of technology and the rapid change in social networking and internet communication we have been inundated with distractions. 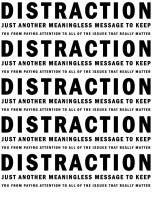 The majority of these distractions are unprofitable. Some even dangerous as in texting while driving or checking Face Book instead of paying attention to where one is either walking or even driving. Most electronic devices, all of which are pandemically common within our day to day living, are a constant interruption with their beeps, buzzes and alarms. These only add to our attention deficit disorder which makes it almost impossible to think clearly or focus on any given project or task. Mankind has become a slave to email, Face Book, Twitter, Linked In and a myriad of other techno-interrupters all designed to make us productively impotent. Time waits for no one. It is given as a Divine investment into one’s life in order for that individual to do something of worth with it. It can be a friend or a foe depending on how it is either used or squandered. Time cannot be horded. It cannot be saved in some hour-glass bank account. It must be spent immediately when it is given. This is why the Apostle tells us that the saint must redeem Time. Time wasting is a sin. It is a simple as that.